Our Point Of Use / Point Of Generation Water Filtration systems are specifically designed to work with conventional as well as alternative energy sources like solar and wind. The core filtration technology can easily be incorporated into a Micro-Grid or Green Building architecture. 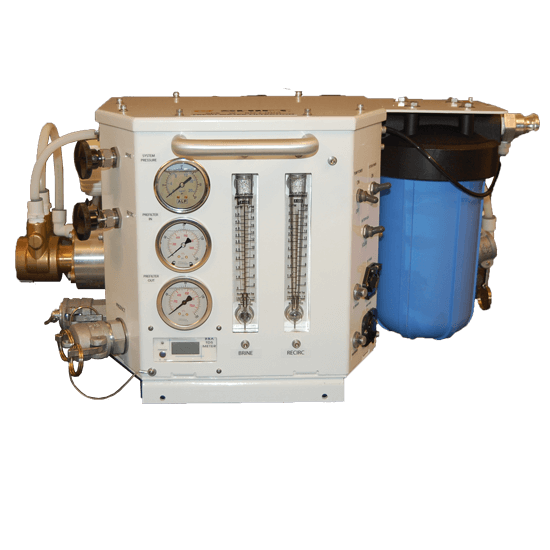 The SPS W 1000-RO is a Reverse Osmosis water filtration solution that is portable for remote locations, disaster relief needs, humanitarian assistance missions or for permanent installations where there is little on no existing electrical power generation capability. The system can produce up to 1000 gallons per day of pure and healthy drinking water. It's Point Of Use, Point Of Generation design is an ideal solution to minimize the logistical burden associated with water movement and can dramatically reduce the "fully burdened cost" of water in a field environment. This system was purchased by USMC for Expeditionary Operations in Tactical Environments and also used by the US MIL. 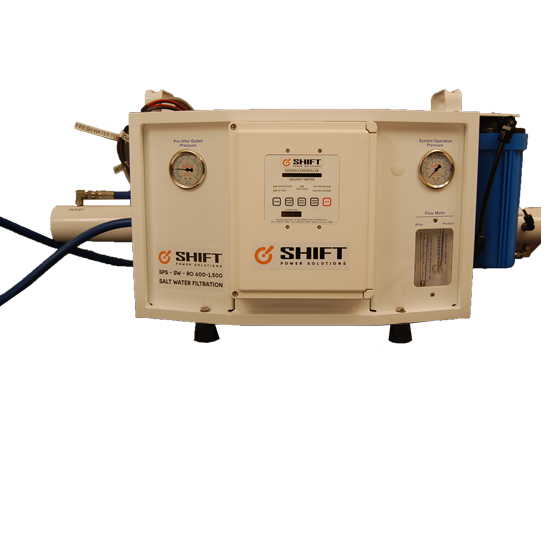 The SPS W 2500 UF uses the Ultra Filtration (UF) process in a portable water solution for remote locations, disaster relief needs, humanitarian assistance missions or permanent installation in a minute package. The UF system, used predominantly in Municipal Water Treatment facilities throughout the USA, can produce up to 2500 gallons of clean water per day from fresh water sources. It consumes very little energy (less than two light bulbs) and produces tremendous yields with little to no waste water. This is the 80% solution for the majority of the worlds needs in water filtration. SPS W2500UF is a Point Of Use, Point Of Generation system designed to minimize the logistical challenges and dramatically reduce the "fully burdened cost" of water in any part of the world for any organization. The SPS W6500-UF/HM/A is designed to support large scale Disaster Relief efforts or Humanitarian Assistance efforts. With a small 6ftX6ftX5ft footprint and a weight of approximately 2900 lbs this system is air, surface or trailer deliverable to a site. It is capable of filtering up to 6500 gallons of fresh water per day on solar energy depending on the weather conditions and solar isolation factor. The system comes with batteries for additional capability and operations when sunlight is limited. Battery recharging takes approximately 4-6 hours based on solar insolation factor. Additionally, the system can utilize power inputs from wind turbines, generator sets, the sister power systems or an established power grid. Once placed the system is very simple to set up (usually within 20 minutes for 2 people) and has minimal O&M costs. 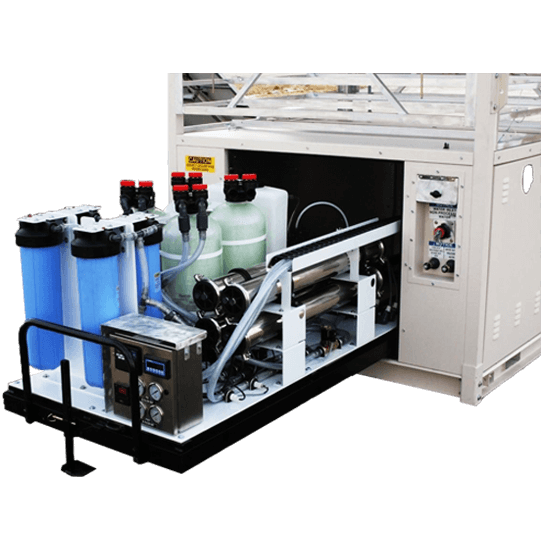 The SPS W 15K-UF is a large scale Ultra Filtration unit for Disaster Relief efforts, Humanitarian Assistance efforts or as a micro utility for a cluster of buildings or village. With a small 6ft x 6ft x 5ft footprint and a weight of 2700 lbs this system is air, surface or trailer deliverable to any site. It is capable of filtering up to 15,000 gallons of fresh water per day on solar energy alone depending on the weather conditions and solar isolation factor. The installed battery allows for night operations and non-sunny days. Battery recharging takes approximately 4-6 hours based on insolation factor. Additionally, the system can utilize power inputs from wind turbines, generator sets, any of the sister Family of Power products or grid power. Once placed the system is very simple to set up (usually within 20 minutes for 2 people) and has minimal O&M costs. 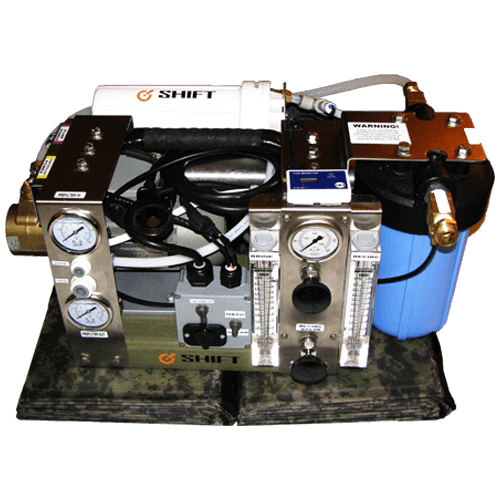 The SPS Salt Water system is a portable and robust desalinization unit for remote locations, disaster relief needs, and humanitarian assistance missions. It filters salt water, brackish and fresh water through the reverse osmosis process and will produce upwards to 1,500 gallons of fresh drinking water per day from a variety of salt water or fresh water sources. Premium filtration of all particulates. Baseline unit is 600 Gallons per day (GPD). Can be solar powered, generator powered or grid tied. Designed to be rugged and deployable. 20 minute set up. Simple operations with annual consumables.